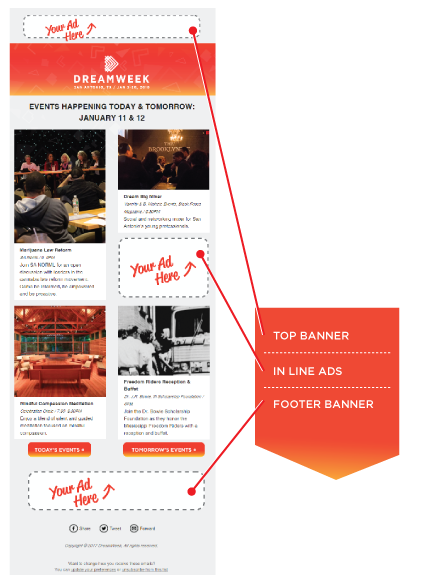 Want to make an in-kind contribution to support DreamWeek? Let us know how you’d like to help. We’ll be in touch with you shortly to go over the details. 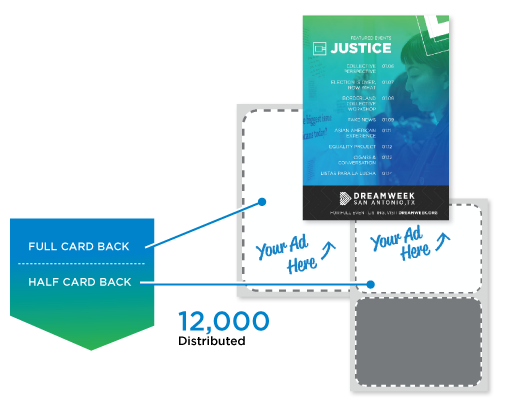 The DreamWeek schedule booklet is inserted and distributed at DreamWeek events, and at various communal locations all throughout the city. 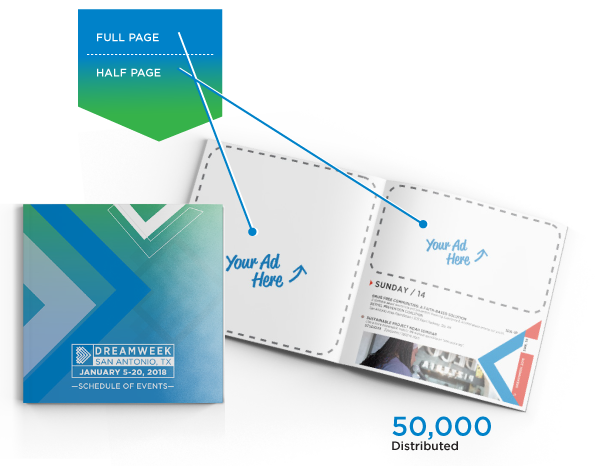 The schedule booklet is a collateral piece that participants continuously look through, so your ad placed inside, will get a lot of exposure. Attendees flip through the booklet on a daily basis, for the entirety of DreamWeek as they plan which events they will be attending. The front of the postcard will explain the theme and list events related to that Dreamweek theme. The back will be advertising space, available in either full or half card increments. 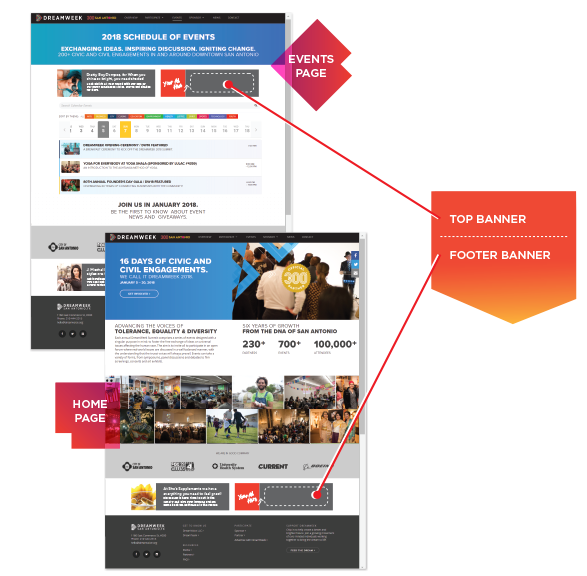 This is a great way to reach a more targeted market. For the past four years, San Antonio for Growth on the Eastside (SAGE) has hosted Taste the Dream, a celebration of diversity and tolerance through international cuisine. Guests are invited to sample a vast array of choice cuisines and enjoy live entertainment and dancing. Dorćol Distilling Co partnered with MOVE San Antonio to organize a mixer featuring all of the candidates running in San Antonio’s 2017 municipal election. Candidates mingled with the audience and each was offered a few minutes to speak to the crowd. Millennial Civic Happy Hour emphasized the value of younger generations taking action in their local community to affect change through the electoral system. The event provided an open platform for young voters to initiate face-to-face conversations with political candidates, empowering those voters to make informed decisions on Election Day. For DreamWeek 2017, SA2020 partnered with the Witte Museum for the official release of the SA2020 Impact Report, a comprehensive review of San Antonio’s progress during the preceding year. The event recognized the organizations and community partners working together to move our city forward. The SA2020 Impact Report Luncheon brought a local perspective to the conversation on diversity and equality. The insight provided by SA2020 highlighted the intersectionality of public welfare and social justice. It was an opportunity to reflect on the ways in which metrics and data collection can offer us a glimpse into the present condition of our community.